Reviewing an AliaVox disc from Jordi Savall is always a daunting task, not only because the presentation is, as always faultless, but also, due to the fact that musical content, is as ever, so sublimely pure, beautiful and authentic. This label concentrates on only about three or four issues a year, so the finished product is always one of exceptional standards and rare musicality. 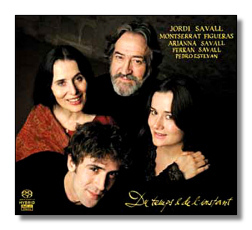 "'Du temps et de l'instant" (Time and Moments in Time) for the first time brings together the Savall family; Jordi, Arianna and Ferran plus Montserrat Figueras and Pedro Estevan in a unique programme conceived as an inter-cultural discourse aimed at pointing or building strong bridges between Eastern and western music, cultivated and popular works stemming from the oral tradition, ancient and contemporary music, different generations of performers and lastly, between performers and audiences (all are Jordi Savall's "objectives"). The musical itinerary consists of 19 tracks, spanning a record-breaking journey through time and space, from the 10th century to the present times. The music is also multinational, hailing from Spain, Greece, Afghanistan, Israel, Morocco, France, Italy and even Mexico. This is a disc emanating from the heart of this musical family to the heart of the listener, transporting him/her through centuries' old genres and traditions, also creating an opportunity to relive history's most elusive and fragile moments in an experience of togetherness. As in all previous issues from this source, the technical standards are outstandingly high, with particular emphasis on clarity and balance, two indispensable elements when the musical timbre is so luscious in its sonority and delicate in its richness of sound. Another wonderful experience to cherish and enjoy as only Jordi Savall can provide.